Fleas in my house are biting me ... what should I do? This is a common question and it sometimes even comes from people who don't own pets (see below). With modern flea medications (insecticides) and shampoos, however, fleas should be only a distant bad memory - unfortunately, for many, they are not. If fleas really are the problem, and it's not something else that is biting you, then flea medications applied directly to your pets may be the easy answer. If, however, you would prefer not to use these relatively expensive topical medications then be prepared to devote some time and elbow grease but either way the problem can be solved - neither you nor your pets should have to live with fleas any longer. First, let's make sure that fleas really are the cause of the bites. Flea bites often occur on the lower legs because fleas can't fly they can only hop onto passing hosts. If furniture or bedding is infested then bites can occur anywhere on your body. For most people flea bites are very similar in appearance to small mosquito bites. So, what a bite looks like is not necessarily a good indication of what caused it. If you find fleas far away from where your pet sleeps it is a pretty good sign that the infestation is severe since fleas try to stay as close to the host animal as possible. Fleas infest animals and their nest (pet bedding) so you must first control the fleas on your pet and in the pet's bedding to have any chance of eliminating them from your house. The easiest way to control fleas on your pet and in their bedding are the topical flea medications like Frontline Top Spot and Frontline Plus (or a generic equivalent that contains fipronil). See Flea and Tick Control In Homes for additional suggestions. There are also a variety of flea medications given in pill form but these all require a prescription from your vet and are considerably more expensive than topical meds like Frontline. Finally, the least expensive but most time-consuming approach is to carefully shampoo and comb your pet using good quality flea shampoos and flea combs followed by treating the home with methoprene to "break the flea's life cycle". Shampoos and combing will need to be repeated as long as you find live fleas on the pet or in the pet's bedding. Do fleas ever infest pet-less homes? Yes and no. Flea pupae, the "resting" stage between immature flea larvae and adult fleas, can survive in an empty home for extended periods, sometimes as long as many months. When a new occupant moves in the pupae may "hatch" into biting, adult fleas. These hungry newly emerged fleas will bite people making it appear that an empty, pet-less house is infested. However, since humans are not good hosts for cat and dog fleas they won't survive long on our blood alone, but they will make your life miserable until they finally die off. In this case, since there are no animals to treat with a topical flea med, you'll need to rely on insecticides to the manage the infestation. Try the botanical insecticide EcoPCO AR-X as a low toxicity alternative to the usual sprays. There are few things more maddening than the itch resulting from the bite of certain insects and mites. So it is a good thing that there are only a small number of insects and mites that actually bite people. However, if you are being affected by what you believe are bug bites but are not sure what is causing your discomfort check the list of "known biters" below. Click the links for ways to identify and then manage each of these common pests. Then, if none of these seem right check out some of the other causes of skin lesions that can look a lot like bug bites. bird mites (aka nest mites, rodent mites) - many people believe they or their homes are infested with these mites. They are actually much less common than people think. What if your bug is not on this list? If none of these bugs are found then maybe something else is causing the "bites". 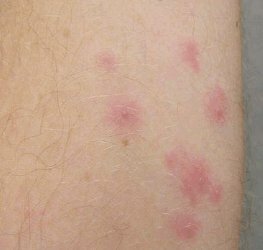 Many things can mimic bug bites and cause very similar skin lesions. Red, swollen, and itchy are the usual symptoms. Physical irritants such as fibreglass insulation and a variety of allergies (food, contact, respiratory) are the most common. Another factor that can be important is any prior experience with a biting pest that you might have had. For example, recently I was contacted by someone that a year before had been bitten by bed bugs in a motel. Needless to say this encounter was both dramatic and traumatizing. Now, a year later, they have developed a rash, probably caused by an allergy to mold, but because of the earlier experience they are convinced that bed bugs are causing the "bites". No evidence of bed bugs are ever found in this case. The lesson is - ours brains are sometimes very good at fooling us into believing things that just are not true! If you are searching for the cause of "mysterious bites" first eliminate the obvious things from the list above but then start thinking about some other possibilities like allergies and irritants. Finally, and perhaps most important, our level of anxiety can greatly influence how we see and react to the world. In the example above, the person was extremely anxious because of their previous encounter with bed bugs. Combined with the appearance of a skin rash that looked a little like the old bed bug bites it is not hard to understand how they jumped to the conclusion that bed bugs were the culprit! I, and many other entomologists, have argued for a long time that a diagnosis of head lice is no reason to keep kids out of school, or to otherwise single them out for special treatment. It now seems that the American Academy of Pediatrics agrees. The new AAP guidelines are aimed mostly at schools and are released at a time when many schools still suspend students that show any signs of head lice, including simple head-scratching and/or the presence of nits (lice eggs). Most head lice infestations can be managed at home with over-the-counter medications and lice combing. There is no reason to exclude kids from school following a diagnosis of head lice. I understand that is can be a very contentious issue with parents but school administrators now have a new tool in the AAP Guidelines to back a decision to ease off on current draconian measures in the face of what is in reality a relatively minor nuisance pest. Remember, according to the best scientific evidence, head lice do not spread disease nor are they an indication of unsanitary conditions. (1) Under this policy schools may prevent students from entering the building if they exhibit signs of a head lice infestation. The sign most often used is the presence of nits, or eggs, in hair. If nits are found, or even just suspected, all students may be subjected to inspection. Students that are believed to have nits may be excluded from class and sent home for treatment.